Leap into Spring with a Tasha Tudor Classic That is Still Relevant and Revelatory! As we approach mid March here at The Snuggery, and look ahead to National Poetry Month in April, I couldn’t let the month slip past without highlighting a perfect salute to the season to come, with an absolutely terrific classic picture book for celebrating the approach of spring, and its dual role as the harbinger of the summer to come. 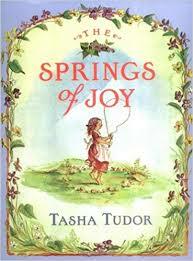 It’s called “The Springs of Joy” by the renowned illustrator and author of iconic picture books, the redoubtable Tasha Tudor. As I love to troll bookstores and scan picture book shelves, I recently asked a salesperson there, if they had any Tasha Tudor titles. The quizzical look I received, more than convinced me I was going to get a “No” to my question. And it also assured me of one other thing. And that is the importance of bringing these important classic authors of picture books forward to parents and readers of successive generations of readers to whom they may not be known. Hence, this precipitated the early stirrings of Liz’s Book Snuggery blog. Do classic paintings lose their relevance in the world of art because they were painted centuries ago? I believe thousands of students in “The History of Art” classes in colleges are still studying and appreciating them. Why are our art museums filled with visitors that wonder and stare at their preserved beauty long after these painters’ demise? So it is with these picture book classics. They are art and narrative on a very special and unique level, and, in addition, their level of potential influence to beginning young readers, is immense…if they are read. Tasha Tudor, Caldecott Honor Book winner for “1 is One” has written prolifically during her years spent in, and writing of, her beloved New England countryside. And here, she continues that theme in the voice of writers as diverse as Mother Goose, Joseph Conrad, Edgar Allan Poe, John Donne, Ralph Waldo Emerson and Shakespeare. This may all seem a bit heady as I write of it, but trust me, when you juxtapose the art of Tasha Tudor with truisms from Emerson, such as “Life is short, but there is always time for courtesy,” it presents an opportunity for exposure to a triple play of art, great writers and the teachable moments for discussion with your young reader. How about this simple quote that resonates all too clearly in a troubled world where children are fearful far too often? “There is no duty we so much underrate as the duty of being happy,” taken from Robert Louis Stevenson. And there are pages of these gems filled with simple, yet sumptuous art, that refers by quote and picture, to the world of a child. I’m for that any day of the week! There is a wealth of wisdom in “The Springs of Joy,” and plenty to share what you rediscover with your young reader, or even present as a gift to a child you may know. Its lessons will last longer than you may know. circumstances for what they are. I don’t believe in circumstances. In a world where renewable resilience in our young is a harder value to find and model, this quote seems very timely and full of hope for challenging times that may perhaps come to them, during their young lives. Please be a child again with a young reader, and rediscover where joy and hope may often be found – in a classic picture book! Thank you for recommending this title. As soon as I finished your excellent essay, I requested the book from my local library. Since planting season is almost upon us, I would like to suggest to your followers one of my favorite children’s books, “Miss Rumphius,” by Barbara Cooney. Thank you for both reading and responding to my post on Tasha Tudor. She is one of my favorite classic picture book authors. She, and others like her, seem to have fallen off the radar of young picture book readers; hence the birth of The Snuggery. I believe I did a posting of Barbara Cooney’s grand adventure of “Miss Rumphius.” Will try and repost. Thank you again for your kind comments!